The Flowerpot Rocks. Such a sweet, grandmotherly name for these giant chunks of stone, each one as big as a breaching whale. 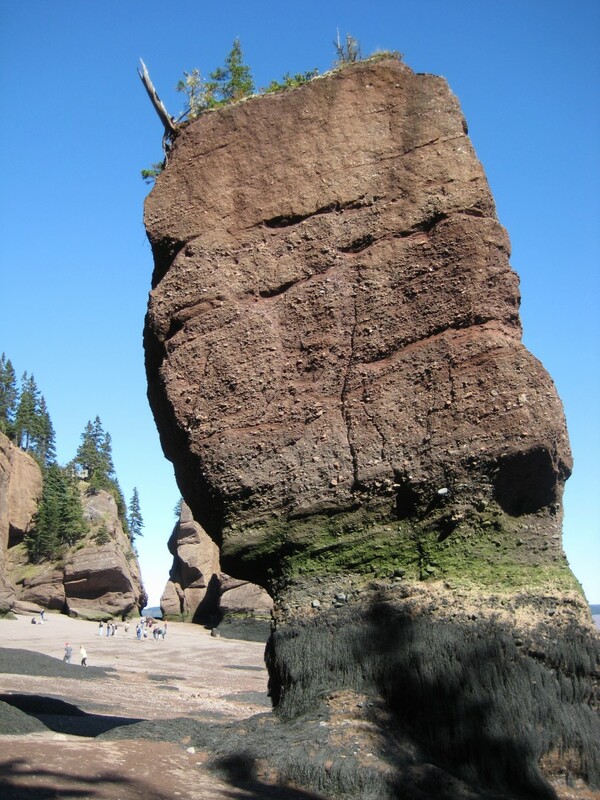 They’re found at the head of the Bay of Fundy in Canada, famous for having the highest tidal range in the world. 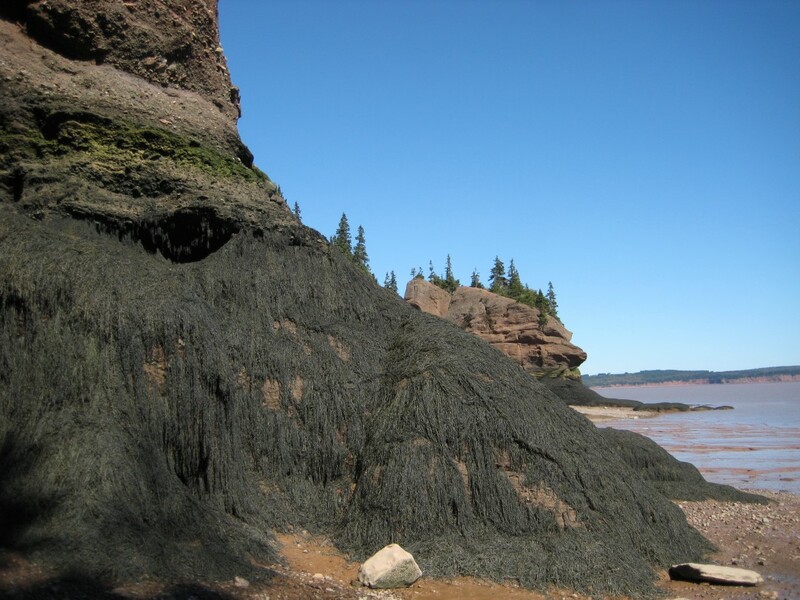 When I read about the Fundy tides, I thought that would mean a dramatic tsunami of water rushing in–but it’s a subtle, almost invisible movement, too slow to notice. The water just creeps inch by inch over chocolate-colored mud flats, and crawls up higher and higher with each gentle wavelet. At low tide, tourists throng around the Flowerpots, snapping pictures, but three hours after low tide, the park rangers shoo everyone back up the cliff stairs. Three hours later, any tourists left standing here would be covered in about twenty feet of water, and the Flowerpots would look like tiny islands. 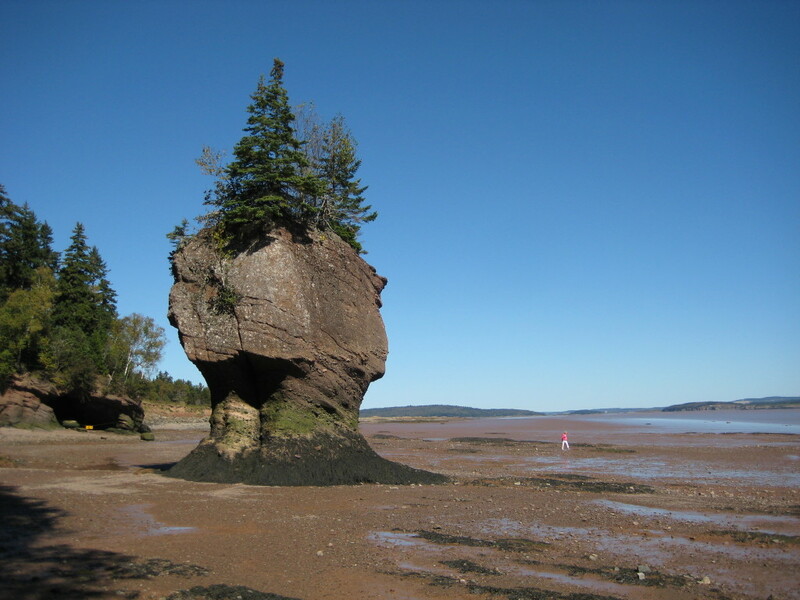 They’re also called the Hopewell Rocks, but everyone calls them the flowerpots, because of the improbable tuft of greenery on top. There’s just room for a hardy spruce or two, or a birch or balsam fir, to perch on the monster rocks. Each of these miniature forests is weirdly isolated, accessible only to birds and insects. Although it looks as though a good strong push would topple them over, the rocks are hard sandstone and conglomerate. But nothing can withstand the tide. Slowly the gentle brown waves erode the rocks. Eventually the flowerpots tumble down, but new ones are always being formed, inch by inch over the centuries.